Gionee is all set o launch Gionee M7 Power smartphone with FullView display will be announced on September 28 at an event in Bangkok, Thailand. The company says the phone has more than FullView Display, hinting at a powerful device. 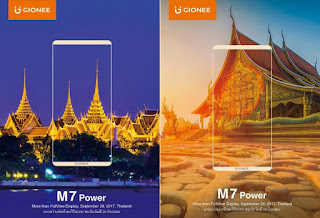 Gionee M7 Power expected to feature a 6-inch (2160 x 1080 pixels) Full HD+ screen with 18:9 aspect ratio, latest MediaTek Helio P30 SoC, 6GB RAM, 64GB storage, Android 7.1.1 (Nougat), 16-megapixel rear camera and an 8-megapixel front-facing camera.M7 Power is also expected to come with a huge battery, which is rumored to be over 6000mAh.